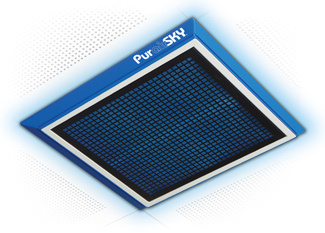 The Purair® SKY ceiling mounted filtration units are designed to protect laboratory personnel and the environment in areas where hazardous substances are handled. Optional BACnet™ networking protocol, compliant with ASHRAE SSPC 135, building automation and control network. EFT Enhanced Filtration Technology. Multi-unit networking options. Ceiling mounted or hanging configurations. The Purair SKY has a dynamic filtration chamber with a sliding filter clamp that allows for simple, quick filter changes. Units come with an epoxy coated steel support frame with LED lighting and wall mounted controls. 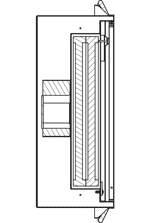 An electrostatic pre-filter helps trap additional contaminants and increase filter life.